When I started teaching romance writing, it took a while for me to realize that there's an aspect of romance we seldom consider in depth. We talk a lot about characterization and plot and conflict. But too often we assume that the love story -- the attraction and progression of our characters as they fall in love -- will just happen naturally. But that assumption is how we get so many characters in romance who move from "I hate you" to "I have to have you forever" with no logical reason -- leaving the reader scratching her head about how on earth these two could ever have fallen in love. Today's post comes from author Ginger Monette, author of Darcy's Hope -- Beauty from Ashes. Ginger has made a study of how to write characters who move plausibly and convincingly from initial meeting to happy ever after. Please welcome Ginger! As romance novelists, it's our job to weave stories that gives readers a front row seat to watch the unfolding of a beautiful love story. So what's the best way to show a couple moving from “Hello my name is” (or even “I despise you”) to “You're my soulmate and I want to spend the rest of my life with you”? Having been disappointed by numerous novels where the couple claimed to suddenly “be in love” without actually “falling in love,” I went on a quest to investigate this mysterious process of falling head over heels. What I discovered changed my writing. So how did this awareness of stages change my writing? In my novel Darcy's Hope ~ Beauty from Ashes, I kept these stages and behaviours in mind as I crafted scenes. They became an outline of sorts that I wove with compelling action, mystery, suspense, and historical detail. When my characters (Jane Austen's iconic Fitzwilliam Darcy and Elizabeth Bennet) are reunited at a WWI field hospital, Elizabeth is none too happy to encounter Darcy. And although she disdains him, I had her acknowledge that he is handsome and there is something between them. This cracks the door to romance and gets readers rooting for the couple. Then, I moved her into the appreciation stage by having her surprise herself by praising and defending Darcy to a colleague. After she directly benefits from his wise leadership, she comes to appreciate him, even though she still doesn't like him. Readers can feel her slowly warming towards him and eagerly turn pages to find out how the couple will sort out the baggage between them. As truths of Darcy's past are dramatically revealed and she comes to understand him better, I have her admit that her initial criticisms were misplaced. Now, with a softened heart, she's able to look at him more objectively. Then I set up an ah-ha moment where she realizes they both share a similar deep-seated insecurity which turns her reservations about him into empathy. Now that her appreciation has turned to admiration, her feelings are almost there! And readers are waiting with bated breath to find out what it will take for him to fully win her heart. I gave him some scenes that show off his admirable qualities, so not only does she find herself attracted to him, she admires his leadership, work ethic, and drive. Then I purposely played up the things they have in common and showed her enjoying his company. In short, I showed them building a relationship. Finally, after they share a heroic act and laugh over a tent whipping in the wind, she realizes that in fact she adores him. Intentionally crafting scenes that follow this four-stage progression of romance enables readers to sense her falling in love, so it's no surprise when she finally declares it. I think a lot of romance authors make the mistake of never showing the characters moving beyond physical attraction and chemistry. It's not easy! But to write a fulfilling romance, the characters need to interact on a deep level and share common interests. Readers should see the couple building a relationship and hear their internal dialog as their thoughts and feelings evolve. Using this four step model, I think Darcy's Hope has succeeded in providing readers a deep sense of satisfaction as they watch the heroine's tiny bud of acknowledgement open into appreciation, then expand with admiration, and finally blossom into full adoration. What challenges do you face showing a couple falling in love? Downton Abbey Meets Pride & Prejudice! Escape to the era of Downton Abbey and experience all the drama of World War 1 alongside Jane Austen's iconic Elizabeth Bennet & Fitzwilliam Darcy. You'll watch their tender love unfold as they learn to work together and reconcile their differences at a field hospital only miles from the Front. When injury and espionage separate the couple, Darcy is crushed. But Donwell Abbey holds a secret that just might change everything. I’ll be the first to admit that there are certain things about English grammar which defeat me. I have a tough time with “who” and “whom”. Whichever one I settle on, it ends up feeling wrong. But some of the other questionable choices in English usage have shortcuts and easy fixes – quick tests to tell you which form is right. I learned these in my high school English classes from some very practical teachers, and I’ve been thanking those lovely ladies (and one gentleman) ever since. Here’s one that hangs up a lot of writers. Wade is making Jane and I go to the store. Or wait -- should it be Jane and me? The test for whether to use I or me (or he or him, she or her, or they or them) is to read the sentence without the other half of the compound. When you leave Jane out of it and read the sentence, it becomes Wade is making I go to the store. Obviously you wouldn’t say that; you’d say Wade is making me go to the store. – so it’s immediately clear that in this usage it should be Jane and me. It’s an easy-peasy test that works in almost all confusing compounds. A very similar test means that you’ll never again have to fret about whether to use its or it’s. The confusion with its / it’s arises because teachers have drummed into us that we form possessives by adding an apostrophe and S. But its is already a possessive (so are his, hers, theirs, ours...) Pronouns, since they have a possessive form, are an exception to the apostrophe-S rule. It’s means it is. Always. So when you’re confused about whether to put in an apostrophe, read the sentence with it is and see if it makes sense. Meanwhile, if anybody has a quick and dirty, foolproof test for who / whom, I’d love to hear it! Including modern attitudes. Far too often in romance fiction, people who were supposedly born and reared in the 1300s or the 1500s or the 1800s think and talk and behave as though they just stepped out of Starbucks holding a latte. It’s true that in order to appeal to today’s reader, main characters tend to be more modern in outlook than their real life peers would have been. But when characters don’t even stop and think about it before they spout today’s perspectives on things like religion, lifestyles and women’s rights, or when they display today’s understanding of psychology, hygiene, nutrition, and medicine, it’s tough to make the reader believe they’re real. Messing up titles. The most common error when it comes to using aristocratic titles is using the wrong form of address, or using multiple forms of address for the same person. Lady Sarah Winchester isn’t the same person as Lady Winchester is. (Lady Sarah is the daughter of a peer, Lady Winchester is Lord Winchester’s wife.) Lord Winchester isn’t the same person as Lord Randolph Winchester. (Lord Randolph Winchester is the younger son of a duke or a marquess, Lord Winchester is the big cheese himself.) Sir James Smythe is always Sir James, not Sir Smythe. When the author doesn’t realize there’s a big difference between variations which seem so small, it’s easy to dismiss the story entirely. Not understanding the rules of inheritance. In the eras most commonly used in historical fiction, illegitimate sons could not inherit titles – period. Oldest sons could not be bypassed in favor of younger ones. Daughters could not pass along titles, except for a very few cases by royal decree. Most often, all the land and money was left to the eldest son. I remember an author who made her heroine a duchess… but not by having her marry a duke, which would be the only way for her to achieve that rank. Instead, this heroine got her title because her grandmother, who was the previous duchess, abdicated and bypassed her daughter in favor of her granddaughter. That’s at least three kinds of impossible. Just plain getting it wrong. Why bother to look it up when we can make it up? It’s tempting to assume that our vague recollection of the timeline is accurate, or figure that if some other historical author used it, we don’t need to check for ourselves. A few prize-winning examples: The Regency hero and heroine who honeymooned on an ocean liner – decades before ocean travel started to be comfortable. The maid who says to her mistress, “It’s chilly; you should wear your wool kid gloves” – they can’t be both wool and leather. The hero and heroine who run away from a London ball to Gretna Green, arriving there early the next morning – but traveling 320 miles took at least 36 hours in those days. A Regency hero and heroine who get married at St. George’s Cathedral – St. George’s Hanover Square is a simple parish church, not a cathedral. This trap yawns equally wide for authors writing in other historical periods. Take a Viking romance which refers to potatoes – five centuries before they were introduced to Europe. Or a story set in 1949 where the narrator says, “He passed out after we hit the interstate” – years before the interstate highway system was even proposed. Some of these things sound pretty obvious when we look at them in a list. But beware – they can sneak up and attack us when we’re not paying attention. This blog was first posted on Sitting on the Porch with Kelly, hosted by author Kelly Abell. HEROIC. Characters in fiction – and especially in romance – need to be heroic. I don't mean heroic in the sense of wearing a cape and tights; I'm talking about heroic in the sense the word was used in classical literature. People in fiction are in some way larger than life. They're more than real people. Their problems are bigger or more intense. Their flaws are more problematic, more likely to lead to huge trouble. Their personalities are brighter, or darker, or richer, or more twisted, than those of ordinary people. In this view, even a villain is a heroic character -- because he's not simply a guy who commits random, casual crimes. He has a plan and a purpose and a motive. EXTRAORDINARY. Think extraordinary, not perfect. In the work of new writers, I see a lot of characters who have it all. They’re gorgeous. They have great jobs. They love what they do. They have wonderful friends. They live in a great house or condo. They drive the car they've always dreamed of. They have designer clothes and shoes and hair. But the thing is, people in books are much more intriguing when things aren’t going right for them – when they’ve lost the job or the condo or the friend. In the same way, the hero/protagonist and the villain need to be balanced. If the villain is so super-powerful and clued in and knowledgeable that it seems the hero can't possibly win, then it's not convincing when the hero keeps stumbling into answers and being saved by coincidence. If the villain is so inept that it's hard to see how he can keep functioning at all, then the hero's victory isn't satisfying and savory. Only when the two sides each have strengths and resources and talents is the battle exciting. What traits do you find necessary to consider when you're developing characters? Author Tierney James has this cool feature on her blog called "Speed Dating for Authors" where she shares intriguing bits and pieces about books and authors -- including trivia or personal details or stuff you wouldn't otherwise know. It's a good place to find new authors or find out more about your favorites. This week I'm featured -- along with some photos of my dollhouse. Yep, that's really a dollhouse! A couple of weeks ago I met fellow author and blogger Kelly Abell when we were both guests on Marsha Casper Cook's radio show. We talked there about the errors that historical authors most commonly make, and that led to Kelly inviting me to guest blog for her. You can read my post on the Top Five Ways Historical Authors Go Wrong here. Enjoy! Under the aristocratic system of primogeniture, followed almost religiously during the Regency period, the eldest son is the heir. He gets the title, the fortune, and the land. But what if there isn’t an eldest son? If a title-holder has no legitimate children, or has only daughters, then the lot goes to the nearest male relative of the title-holder. The next in line would be the title-holder’s next-younger brother, and then his sons (if he has any). If the younger brother has no children or only daughters, the title descends to the next brother in the original family, and then to his sons. An eldest son is known as the heir apparent, because no matter what happens, if he outlives his father he will inherit. Because no one can come between him and the title, he is the apparent – obvious – heir. If there is no oldest son, then whoever stands next in line is known as the heir presumptive. Since the title-holder could still sire a son (no matter how unlikely that might be), the heir presumptive could still be pushed out of the line of succession. So he’s presumed – but not guaranteed – to be the heir. If the title-holder dies without a surviving son, but his widow is pregnant, then everything comes to a halt until the baby is born. If it’s a boy, he will hold the title from the moment of his birth. But if it’s a girl, then the next heir in the male line wins the jackpot. Lady Mariah Gerrard anxiously awaits the birth of her stepmother’s child, desperately hoping for a boy who will inherit their father’s title so Mariah can gain access to her dowry and her freedom. 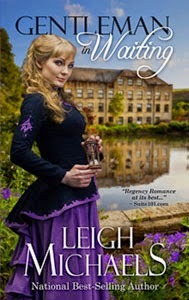 Her father’s cousin John, the next heir in line, has other plans – so if the baby is a girl, disaster looms for Mariah. When Myles Moreton comes to Edgeworth to manage the family estate, Mariah’s no longer certain that even the birth of a boy will solve her problems. Why is money missing? Why is Mariah’s dowry in doubt? Despite his genial façade, is Cousin John planning mischief – or worse? Why is Myles Moreton, rather than the late earl’s trustees, suddenly in control? And how can Myles -- a man who’s entirely ineligible -- be not only completely maddening but utterly charming and very, very tempting? As the family gathers to await the birth, Mariah and Myles search for answers – and they find that playing the waiting game can have its own rewards.